Пахтаи тайёр барои ғунучин. Photo courtesy of USDA Natural Resources Conservation Service. Пахта маҳсулоте ки ҳамчун растани меруяд (Gossypium spp. ), муқими дар маҳаллаҳои тропикӣ ва субтропикӣ ҳарду дар Ҷаҳони Нав ва дар Ҷаҳони Кӯҳна. Ин маҳсулотро ғалтак мекунанд ва ба материали хеле мулоим ва нарм табдил медиҳанд текстил, ки бештар барои сару либос дар ҳоли ҳозир истифода бурда мешавад. Номи Англисии "пахта" аз калимаи Арабии al qutun, гирифта шудааст. Successful cultivation of cotton requires a long growing season, plenty of sunshine and water during the period of growth, and dry weather for harvest. In general, these conditions are met within tropical and warm subtropical latitudes in the Northern and Southern hemispheres. Production of the crop for a given year usually starts soon after harvesting the preceding autumn. Planting time in spring varies from the beginning of February to the beginning of June. Cotton fiber originates from the cotton plant, an important crop in tropical climates and warm temperate climates. Commercial species of cotton plant are Gossypium hirsutum (U.S.A. and Australia), G. arboreum, G. herbaceum (Asia), and G. barbadense (Egypt). Cotton has been used to make very fine lightweight либос in areas with tropical climates for millennia. Some authorities claim that it was likely that the Мисрians had cotton as early as 12,000 BC, and evidence has been found of cotton in Мексикои caves (cotton cloth and fragments of bloody fibre interwoven with парs and пар) which dated back to approximately 7,000 years ago. There is clear archaeological evidence that people in South America and India domesticated different species of cotton independently thousands of years ago. In Перу, cotton was the backbone of the development of coastal cultures such as the Moche and Nazca. Cotton was grown upriver, made into nets and traded with fishing villages along the coast for large supplies of fish. The Spanish who came to Mexico in the early 1500s found the peoples there wearing cotton clothing and growing it. During the late mediaeval period, cotton became known as an imported fibre in northern Europe, without any knowledge of what it came from other than that it was a plant; people in the region, familiar only with animal fibres (wool from sheep), could only imagine that cotton must be produced by plant-borne sheep. 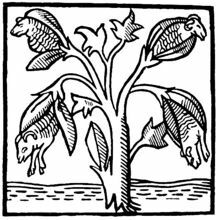 John Mandeville, writing in 1350, stated as fact the now-preposterous belief: "There grew there India a wonderful tree which bore tiny lambs on the endes of its branches. These branches were so pliable that they bent down to allow the lambs to feed when they are hungrie.". This aspect is retained in the name for cotton in many European languages, such as German Baumwolle, which translates as "tree wool". By the end of the 16th century AD, cotton was cultivated throughout the warmer regions in Africa, Евразия and the Америка. The Indian cotton processing industry was eclipsed during the British colonial rule, as part of the British mercantile policy of deliberate and systematic de-industrialization of India, which forced the closing of Indian factories and processing facilities. The intent of this British policy was to ensure that colonized lands supplied raw materials and that Britain should retain a monopoly on manufacturing. In addition, the invention of the spinning jenny (1764) and Arkwright's spinning frame (1769) enabled cheap mass-production of cotton cloth in the UK. Production capacity was further improved by the invention of the cotton gin by Eli Whitney in 1793. As a result of these policies and developments, British traders developed a commercial chain in which raw cotton fibres were sourced initially from their colonies, processed into cotton cloth in the mills of Lancashire, and then re-exported back on British ships to their captive colonial markets in West Africa, India, and China (via colonized Shanghai and Hong Kong). Later, when the superiority of the American varieties of cotton was established, owing primarily to the length of the fibers, the British started purchasing cotton from slave plantations in the United States and the Caribbean. Due to the enormous quantities of raw cotton required to make cheap bulk exports, British industrialists quickly abandoned expensive raw cotton produced in India in favour of mass-produced cotton from the southern United States, which was much cheaper as it was produced by unpaid slaves. By the mid nineteenth century, "King Cotton" had become the backbone of the southern American economy, and today, roughly 90% of the world's cotton crop is of the long-staple American variety. In the United States, growing the three crops, cotton, indigo and тамоку, historically was the leading occupation of ғӯломон. 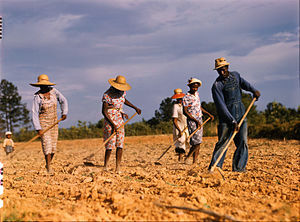 After emancipation, the share cropping system evolved, which in many cases differed little from the systems of slavery. During the American Civil War, American cotton exports slumped due to a Union blockade on Southern ports, prompting the main purchasers of cotton, Britain and France, to turn to Egyptian cotton. British and French traders invested heavily in Egyptian cotton plantations and the Egyptian government of Viceroy Isma'il took out substantial loans from European bankers and stock exchanges. After the American Civil War ended in 1865, British and French traders abandoned Egyptian cotton in favour of cheap exports from the United States, sending Egypt into a deficit spiral that led to the country declaring bankruptcy in 1876. Today cotton is produced in many parts of the world, including every continent except Antarctica. Cotton plants have been selectively bred so that each plant grows more fiber. In 2002, cotton was grown on 330,000 km² of farmland. 47 billion pounds (21 million t) of raw cotton worth 20 billion USD was grown that year. The cotton industry relies heavily on chemicals such as fertilizers and insecticides, although a very small number of farmers are moving towards an organic model of production and organic cotton products are now available for purchase at limited locations. Historically, in North America, one of the most economically destructive pests in cotton production has been the boll weevil. Due to the US Department of Agriculture's highly successful Boll Weevil Eradication Program (BWEP), this pest has been eliminated from cotton in most of the United States. This program, along with the introduction of genetically engineered cotton containing a gene that codes for a plant-produced protein that is toxic to a number of pests such as tobacco budworm, cotton bollworm and pink bollworm, has allowed a reduction in the use of synthetic insecticides. Offloading freshly harvested cotton into a module builder in Texas. Previously built modules may be seen in the background. Most cotton in the United States, Europe and Australia is harvested mechanically, either by a cotton picker, a machine that removes the cotton from the boll without damaging the cotton plant, or by a cotton stripper which strips the entire boll off the plant. Cotton strippers are generally used in regions where it is too windy to grow picker varieties of cotton and generally used after application of a defoliant or natural defoliation occurring after a freeze. Cotton is a perennial crop in the tropics and without defoliation or freezing, the plant will continue to grow. Beginning as a self-help program in the mid-1960s, the Cotton Research & Promotion Program was organized by U.S. Upland cotton producers in response to cotton's steady decline in market share. At that time, producers voted to set up a per-bale assessment system to fund the Program with built-in safeguards to protect their investments. With the passage of the Cotton Research & Promotion Act of 1966, the Program joined forces and began battling synthetic competitors and re-establishing markets for cotton. Today, the success of this Program has made cotton the best selling fiber in the U.S. and one of the best selling fibers in the world. Administered by the Cotton Board and conducted by Cotton Incorporated, the Cotton Research & Promotion Program is the program that is continuously working to increase the demand for and profitability of cotton through various research and promotion activities. The Program is funded by U.S. cotton producers and importers. Egyptian cotton is considered to be one of the best types of cotton, and is produced in various quality levels in long-staple (LS) and extra long-staple (ELS). Cotton is used to make a number of textile products. These include terrycloth, used to make highly absorbent bath towels and robes, denim, used to make blue jeans, chambray, popularly used in the manufacture of blue work shirts (from which we get the term "blue-collar"), along with corduroy, seersucker, and cotton twill. Socks, underwear, and most T-shirts are made from cotton. Bed sheets are also often made from cotton. Cotton is also used to make yarn used in crochet and knitting. While many fabrics are made completely of cotton, some materials blend cotton with synthetic fibers such as polyester or rayon. In addition to the textile industry, cotton is used in fishnets, coffee filters, tents and in bookbinding. The first Chinese paper was made of cotton fibre, as is the modern US dollar bill and federal stationery. Fire hoses were once made of cotton. The cottonseed which remains after the cotton is ginned is used to produce cottonseed oil, which after refining can be consumed by humans like any other vegetable oil. The cottonseed meal that is left is generally fed to livestock. In the past, cotton seeds were used by women as an abortifacient. The greatest ecological threat to cotton plants is the boll weevil. During the late nineteenth century and early twentieth century, boll weevil infestations caused significant damage to annual cotton crops in the southern United States, resulting in frequent economic depressions in rural areas. Cotton is an enormously important commodity throughout the world. However, many farmers in developing countries receive a low price for their produce, or find it difficult to compete with developed countries. This has led to 'fair trade' cotton clothing or footwear (Veja Sneakers) being available in some countries. The fair trade system was initiated in 2005 with producers from Cameroon, Mali and Senegal.